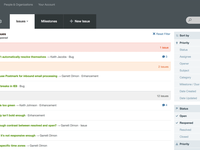 Sifter is a simple bug and issue tracker for teams that want their non-technical team members to help with issue tracking. By focusing on ease-of-use, Sifter helps decrease friction and increase participation leading to more bugs found, logged, and fixed. Pros: One of the strongest points of Sifter is the simplicity and ease of use of the product. 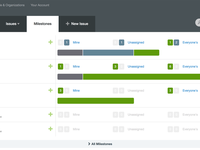 Compared to other issuetrackers and bugsystems you have almost no buttons, fields and things to configure. That's great, because it makes it extremely fast to do things and makes sure everybody puts everything is into Sifter. Overall: Try it out! I've used MantisBT, Flyspray and Fogbugz before Sifter, Sifter wins because of simplicity. It's so easy to get an issue in that you always will do it and there is no excuse in not getting a issue in! The lack of custom fields will be a great win when you have a team that trusts each other in filling in enough details to help itself out. Cons: Not a whole lot of changes to the product over the years. The home page has the same image that has been there forever. Overall: I've used Sifter for the last 6 years. We'll sometimes explore other options, but always come back to Sifter because of its ease-of-use and simplicity for both the person logging the issue as well as the person resolving the issue. Every time an update is made to the issue, the relevant individuals are notified via email. If you want to issue a call-out to someone, you include their name with the @ symbol in the message, and they also get notified. 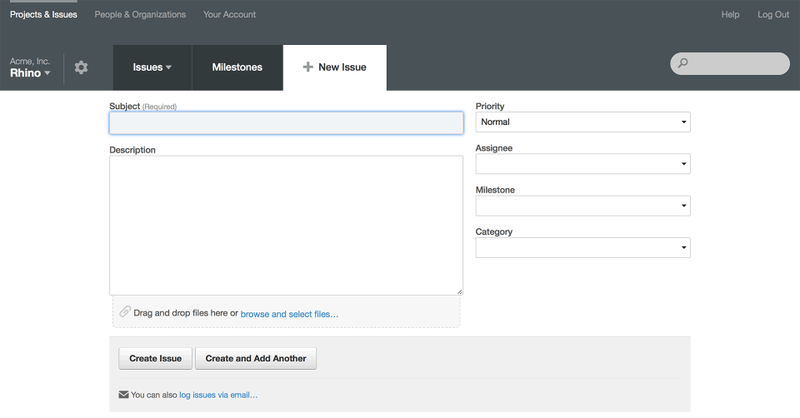 Enter a subject and a description when you log the issue, and Sifter takes care of the rest. I also like that Sifter host the software--it doesn't require a server installation maintained by me. Recommendations to other buyers: If you want to hit the ground running with bug tracking simplicity, this one is it. Comments: I've been using Sifter for years to keep track of very complex software projects and expect to be a customer for life. Cons: There's nothing I don't like. There could be fancier add-ons, but I would just be paying for things I don't need. Sifter is simple and direct, exactly the way a minimalist tech or non-tech needs to communicate with a tech, beginner or pro. Pros: I love the simplicity of Sifter. It's biggest plus. Other trackers include a lot of stuff that ends up being unused and does nothing more than cluttering up the screen. Cons: Some may see the inflexibility of prioritization as a minus. It's really not. Overall: I've spent many years of working with issue trackers having features that may add to a bulleted list of features on their marketing site, but aren't useful in the least. Sifter goes against the grain by focusing on the issue. Pure and simple. And Sifter's simple enough to use that I don't have to give each client a course in how to record an issue and they don't waste time trying to figure it out. Comments: Highly recommended. Beautiful product, created very intentionally to be simple and without feature bloat. Excellent for small and medium sized teams. 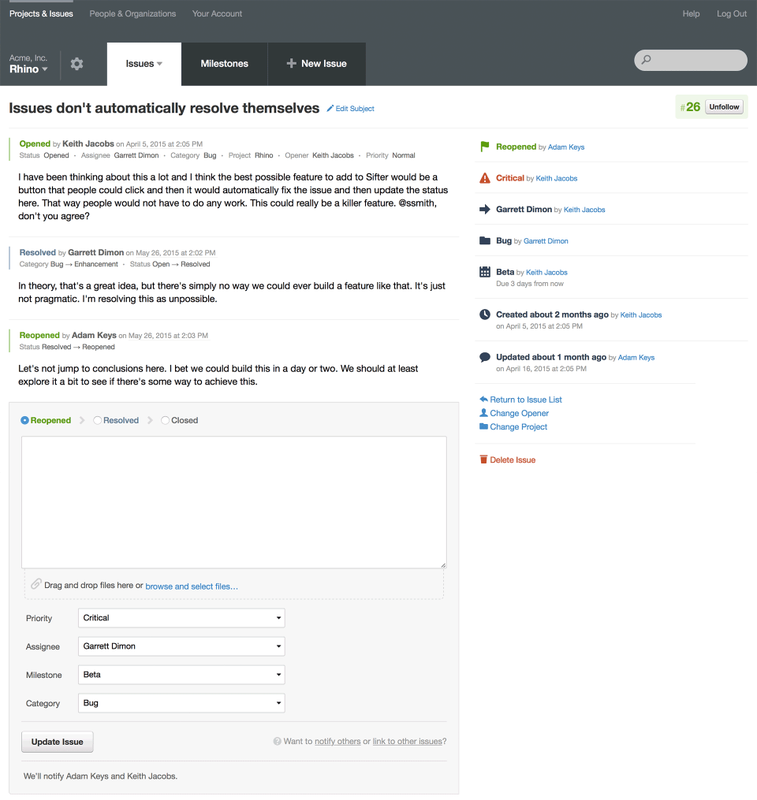 - Excellent design, making it pleasant to use; compare screenshots of Sifter to those of Jira or YouTrack and you'll see what I mean. --> Example: you can't add a custom status such as "On Hold" or "Pending". This forces you to talk to your team and figure out what to do with a tricky issue. You can't cop out. - Customer support is the best I've ever had. The founder, Garrett, will personally respond with a thoughtful message within minutes or an hour at most. Absolutely phenomenal. Sometimes he'll even implement your suggestion instantaneously! - As your team grows, you may find that you want more complex and messy features, such as tagging, ordering issues by exact rank rather than priority level, integration with a build server, custom email notifications, integration with a screen shot capture, integration with project management software, grouping issues into releases (without creating a whole new project for them), etc. However, Garrett is constantly working on making the product flexible while still dead simple. Pros: Pretty much everything. Easy to use, track, sort and add people to your team. Did NOT try to do too much with the software. Cons: Not really that much. Maybe give a little more help on use, but still super happy with it. Overall: This software was key in getting my company, Well Beyond Care launched, and we still use it to manage updates, defects, and ideas. 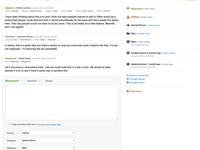 Comments: I've been using Sifter for over three years, and it's something my team and I rely on every day to keep track of issues with our SaaS product. The UI is clean and uncluttered, and it's easy to create tickets, categorize and assign them, change their status, move them to a milestone and basically keep them organized. The API allows our Beanstalk account to integrate with Sifter, so issues are synced with code changes in our repository. 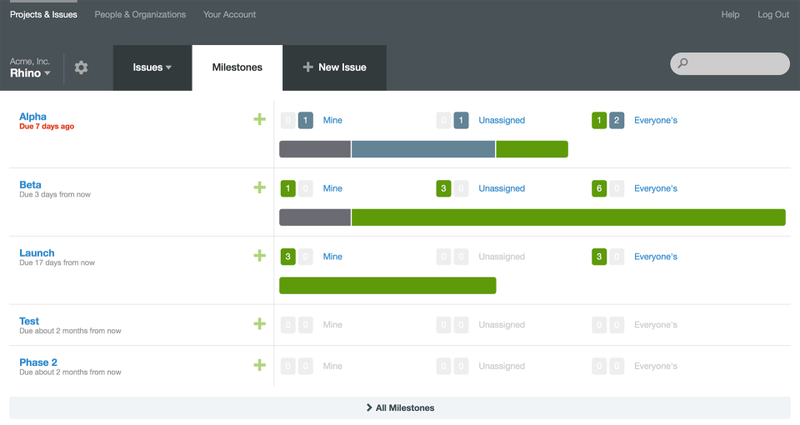 The only thing I wish is that you could check off issues and change their status/milestone/category/assignee at once, which they assure me is on their product roadmap. Finally, the customer support is incredible. Any time I've needed to contact support over the years (which wasn't often because the product is solid), I've had service that is above-and-beyond what I expected in terms of speed, friendliness and helpfulness. Without the clunkiness and complexity that plague other bug trackers, Sifter is perfect for development teams that want a simple, elegant solution. Comments: Before using Sifter, we had a haphazard process of emailing bugs from clients, and trying to track them in a spreadsheet. You can probably tell how terrible that was. Everyone along the process is happy with Sifter. Project managers are happy with how easy it is to create issues, and how easily they can see what the status is. Our developers love it because of the centralized location of all issues, and it lets us integrate with our favorite tools like Github! I should also mention the ridiculously high level of customer service we've received from the team. We never wonder if this is the right peice of software. No longer do bugs fall through the cracks of nested email threads. Sifter keeps everything tidy and everyone being friends! Pros: Simple. Feature Rich. Intuitive. Incredible User Experience, and even better support! Cost effective, Fast! Cons: Honestly? None. Sifter is a truly remarkable cloud based tool for our entire development team. Comments: I love using Sifter. It allows me to manage and organize myself around the issues I need to do. The simplicity and ease of use of this application is wonderful. Issues don't get clustered in a hard to read format. Search and filtering of issues is excellent. I also love the daily summary report which shows me the work I did the previous day. Also of value to me is how I can track the history of an issue and all the train of thought that is attached to an issue. I totally love this application because it's so relevant and yet simple to use. Pros: Sifter is exceptionally easy to use. This is important because we expect our clients to use it as well, so the tools have to make sense without instruction. Cons: I can't come up with any cons. Overall: From our clients to our team, everybody who uses Sifter loves Sifter. 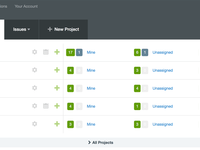 It's become an important part of our project cycle; we use it for QA on nearly every project prior to launch. We're going on our fourth year of heavy use, and I can't recommend it highly enough. Comments: Sifter is simple ticket tracking. And I use simple in a good way, because honestly why would you want it to be complicated. Complicated is hassle. and Hassle is bad. 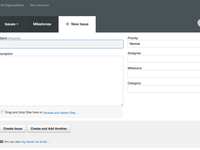 We use sifter to effectively manage your development tickets. We can assign them easily to different members, and easily have multiple people contribute to the discussion. This allows the team to spend most of their time developing and not managing the ticket system, which is great. Comments: - Recently I had some non tech savvy clients logging issues. They found the whole thing easy to use and not once did I have to explain how to use Sifter. - I've been using Sifter on and off for over three years and I've never experienced any issues with slow speed or features not working. - If you ever did have a problem, then you just email customer support and you received a friendly email within 24 hours. Overall: Sifter is an extremely well designed, dependable service that I would honestly recommend to any company even non-technical enterprises. Without Sifter, there is doubt that my organization would be weaker. Comments: Sifter is an incredibly valuable tool for my company. We use it for everything from basic task management to quality assurance testing. Our developers, designers, and project management teams love it. The app is well thought out from top to bottom. I've been using it for 3 years now and have nothing but good things to say about it. Cons: Don't use this for huge enterprise-y systems across multiple departments. Pros: Clear user interface, great support, easy to manage bug and issue tickets. Cons: The only con was integration with other tools (like version control service Beanstalk) but that was addressed in a previous update. Overall: Sifter has been core to our development workflow on client projects. Pros: My clients and team all love using Sifter. Very easy to use and feature-rich enough to get the job done efficiently. Cons: None that I've found. 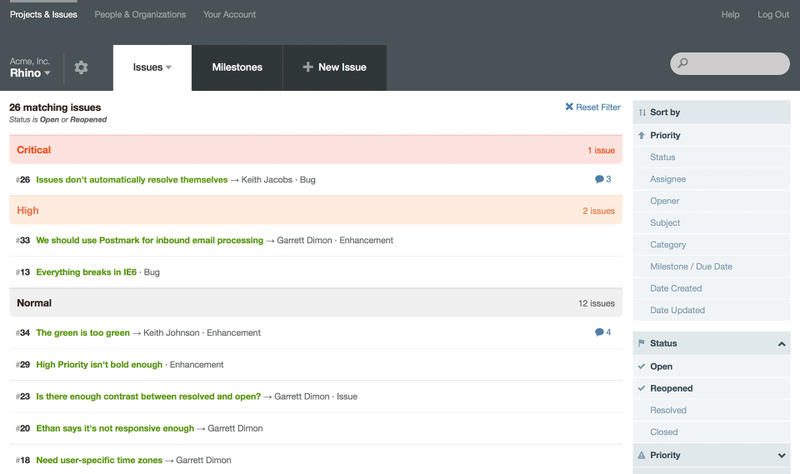 Overall: I would recommend this application to anyone for managing Action Items and bugs/issues on a project.